It requires updated gaming version. It is a 14 day road map. It has 10 stages plus 1 completion Bonaza. Each stage has different tasks and rewards. A Scroll Button will appear on the left side of your turf which will guide you throughout. It is basically meant to guide budding users. However, the big castles can also participate. Lord's Mobile feel sorry for those players who are on big Research and Construction tasks. It is advisable not to cancel a month long research or construction task for this quest. The rewards may not compensate your loss. 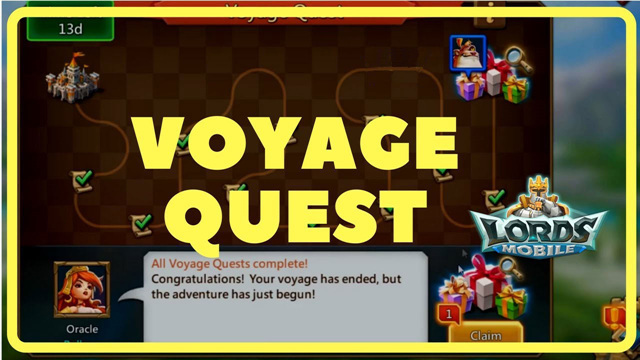 So guys IGG Lord's Mobile have announced the date for upcoming Voyage Quest. It will start on 1/6/2018. All the best, have fun and get it done wisely. Disclaimer: The information is based on personal experience. A small mistake can cost you big. It is advisable to learn before investing your money and time. New Hero – Shelley the Snail Princess! 1 Billion might account zeroed in 20 minutes! !